The smaller screen has been harder to get used to than I thought it would be. I always thought of the larger screen size of my Dell Inspiron laptop as an asset, I didn't appreciate what an asset it was until I switched to this 10.1" screen. Fortunately UNR has a neat little feature that helps you get the most of your pixels: when a window is maximized, it will merge the title bar with the menu at the top of the screen. The battery life on this thing is fantastic. Thanks to the power-sipping Atom processor, the battery will last about 5 1/2 hours. The Dell laptop's Pentium 4 would guzzle down the battery's juice in about 45 minutes (if I was lucky). Unfortunately the touchpad driver does not support multitouch, so 2-finger scrolling does not work. UNR provides an "edge scrolling" option, which is what I'm using now, but it would be great to get 2-finger scrolling back. 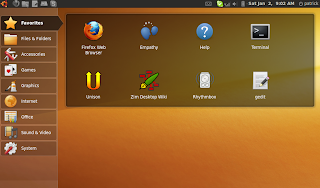 Like other netbook OSs that I've seen, the menu is integrated with the desktop. It looks really slick, is easy to use, and does a good job of utilizing the netbook's limited screen real estate. I love this little unit, but I'm not sure that I agree with the initial netbook vision. Netbooks were supposed to be little more than a dedicated web-browser, with most of the applications, and therefore computing, done in the cloud. Although most of what I do on this machine involves the web browser, there are plenty of client applications I use. Sure, I am not going to be running VirtualBox on this machine any time soon, but this machine wouldn't have one-tenth the value to me if it couldn't run applications like Liferea, Zim, Unison, Empathy, and Rhythmbox in addition to Firefox. Furthermore, I'm not sure that the manufacturer of this device really believes in the original vision for the netbook either. The original netbooks (and here I'm speaking of the Asus Eee) had a single-core Celeron processor, with a trimmed-down customized version of Xandros Linux, and 4 gigs of internal flash storage. That was much more consistent with the web-browser-only ideal than today's netbooks. This Acer Aspire One has a dual-core Intel Atom 1.6 Ghz processor, 1 gig of RAM, and 160 gig hard drive, and it shipped with Windows XP Home Edition. It seems clear to me that the public liked netbooks but wanted a higher level of functionality than was available in the first generation of netbooks, and Acer along with the manufacturer of every other netbook I am aware of, has delivered. I'm absolutely thrilled with the results. It appears that some hardware manufacturers have picked up on the recent netbook trend and have decided to declare war on it. Litl, LLC along with a few other companies are attempting to return to the original netbook vision with the "webbook", which is truly a web browser with a keyboard attached. I wish litl the best of luck in their endevours, but I fear for their sake that the days of terminal-mainframe topologies are behind us, and that people will always want their machines to have some modicum of capability.